Check out my spangly gold nails! You get 16 strips so that they can fit from small to large nails and possibly even toes. Before I applied these I'd cut all of my nails quite short because of a break, so I actually only need half the length of a strip to cover each nail, so I can get a double application from this one pack. I found this really quite easy to apply and managed to get them almost perfect. I did spend quite a while patiently putting them on though - I wouldn't recommend using them in a rush! They lasted pretty well - longer on me than normal polish, before they started to chip and when they did, I touched up with a gold glitter polish to stretch the manicure for a couple more days. They were also quite easy to get off with nail polish remover unlike usual glitter polishes. I don't think these Sally Hansen nail wraps are available in the UK. But I've had a look on eBay and you can buy them from this US seller in all of the below shade / pattern options. My Mum also got me the floral pattern ones. 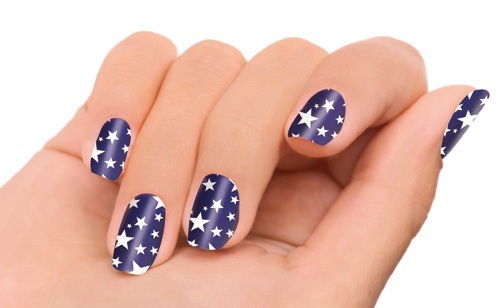 I've noticed that Myleene Klass has brought out her own brand of nail wraps and I'm really keen to give them a go - I love this star print one. I've had trouble finding where to buy them - her website says they're sold in Boots but I couldn't find them on the website. The only place I can find them is JML in a pack of 5 patterns for £19.99. I like this first pack the best because you get the star ones and also a lovely pink and blue floral print which reminds me of Cath Kidston. These glitter ones are also really pretty, especially for Christmas. Please let me know if you've found somewhere to buy the Myleene nail wraps or if you've tried them. Don't forget to enter my Christmas giveaway to win some OPI muppets nail polishes! Wow it looks gorgeous <3 Nice blog honey...I'm a new follower! These look so pretty! I'm trying to grow my nails and not sure whether to try nail wraps until i get better at painting my nails lol! Those gold glittery nail wraps looks so pretty :) I heard the Myleene Klass ones aren't that good. Somebody did a post on them not too long ago (I can't remember who it was otherwise I would link the post) and some of the designs messed her nails up when she took them off. I love the gold glitter on you - so pretty! I've not tried nail wraps yet. Seem to be all the rage at the moment and they look lovely! I am currently wearing the black glitter nail wraps from Myleene's range they were on offer in ASDA for £5 a set. So far they have lasted a week with no chips or bubbles, nail wraps are great for that plus they look far neater than nail varnish...bit nervous now about taking them off after reading comment above! !